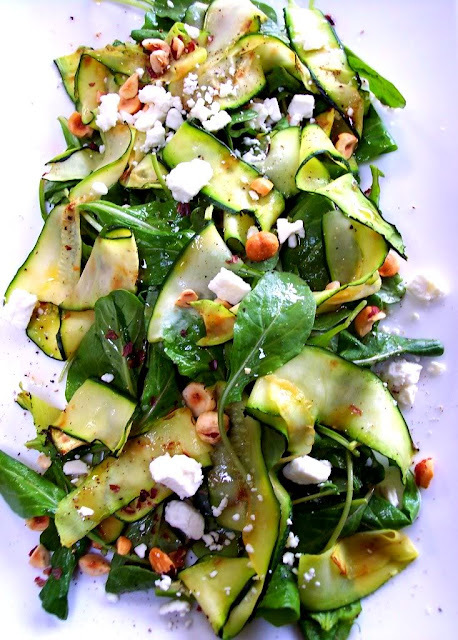 Since May is National Salad Month, I'd like to share this wonderful Zucchini Ribbon Salad with you. I came across it last year on one of my favorite cooking blogs, Proud Italian Cook. I've made it several times and lightly grilling the zucchini strips really adds great depth of flavor. I used my panini maker to grill the them and it was quick and easy. I omitted the garlic clove from the dressing and used an 18 year aged balsamic vinegar. I've also made a version adding sweet cherry tomatoes and using pine nuts instead of hazelnuts. It was equally fantastic and I loved the pop of color that the cherry tomatoes gave it.